Welcome to Amish Country Lodging with three convenient locations in Berlin. We offer private cabins, cottages and suites with two-person jacuzzi, fireplaces, kitchenettes, saunas, pool tables, outdoor hot tub and much more! Perfect for a couple's getaway, family vacation, or retreat. Locally owned and operated for 14 years! Escape. Gather. Shop. Taste. Experience. 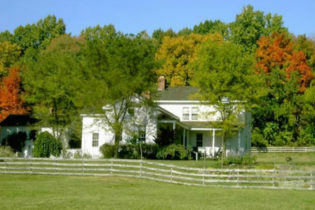 Amish Country Lodging offers Cabins, Cottages and Suites in Berlin, Ohio’s Amish Country. Enjoy the shops and restaurants Berlin has to offer while staying in luxury with a jacuzzi, fireplace, sauna, pool table, full living room and kitchenette. Coblentz Cabins Log cabin comfort at its finest! A perfect choice for couples or families alike. Each cabin is clean, spacious and full of amenities. We offer a two person jacuzzi, fireplace, full living room area, kitchenette, free internet, cable tv, fire rings, charcoal grills and much more. Cabins offer a king sized bed or two queen sized bed. Cabins can accommodate anywhere from 2-8 guests. Located on a small, quiet road off of Berlin’s Main Street. Pine Cove Lodge A romantic getaway for couples, our Pine Cove Lodge offers rustic suites and cabins on a secluded 7 acre property in Berlin. All suites and cabins offer a king or queen sized bed, two person jacuzzi, stone fireplace, living room, internet access, cable tv, rustic locally made Amish log furniture, and an outdoor private patio or porch. Enjoy the walking trail around our pond and the seclusion and privacy our property offers. Berlin Cottages Two new cottages located right amongst the shops in Berlin. Our cottages offer old world design mixed with modern comforts. Each cottages offers two bedrooms, two bathrooms, full kitchens, full living room areas with fireplace, two person cedar saunas, pool tables, two person jacuzzi, free internet access, three lcd televisions, outdoor patio with rocking chairs, and much more. Located in 100 acres of Ohio Forestry Land, Bear Creek Farm Bed and Breakfast and Guest Cottage offers country elegance in God’s creation. The big house has three rooms with private baths and the cottage sleeps six comfortably. This is not the fast lane, but a place for quiet and relaxation either in the comfortable, welcoming house, porch, yard, pond or trails in the woods or in our fully equipped Guest Cottage. Jerry and Judy are thankful to have this home to share with you and your loved ones and we welcome you to come an experience peace and quiet in God’s creation, recharging your soul and hopefully renewing valuable relationships. We love to have families here for reunions, couples for their anniversaries or just couples who need a time away and even singles who a need silence and solitude retreat. 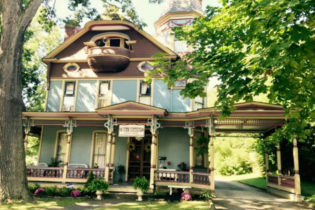 The Charles Nelson Schmick House is a Victorian Bed & Breakfast located in Leetonia, Ohio. The elegant 1870 home is perfect for intimate weddings and romantic getaways. We often host murder mystery and other themed dinners for guests to enjoy. We offer 5 guest rooms with private baths, featuring charming details like marble fireplaces, antique beds, and claw-foot tubs. All overnight stays are complimented with a full gourmet breakfast and evening dessert. The inn offers 5 spacious and private guest rooms that provide a relaxing environment in a very comfortable setting. Each accommodation is uniquely appointed and has its own bath. The inn caters to small gatherings, private parties, weddings, reunions, and welcomes the business traveler. A delicious hot breakfast is served each morning that can be enjoyed in your room before exploring the many activities and attractions in Columbiana County and the surrounding area. A visit to Donna’s Premier Lodging is the perfect way for you and that special someone to experience everything Holmes County’s Amish Country has to offer. We’re close enough for a romantic weekend getaway, yet far enough away to offer an idyllic escape from the hustle and bustle of everyday life. Signature accommodations at Donna’s range from private cottages, suites and villas situated near the heart of Berlin to secluded chalets and cedar log cabins tucked away in the woods nearby. Every room includes a fireplace and Jacuzzi to help set the stage for a romance-filled weekend, and a charming continental breakfast is always included. Donna’s Premier Lodging is conveniently located close to the many delightful gift shops and attractions found in Berlin, Ohio, with Amish Country’s gently rolling hills, cheese shops, entertainment venues and more a quick, leisurely drive away. At Donna’s, providing the highest levels of service and serenity is our passion. We look forward to helping you rediscover yours. 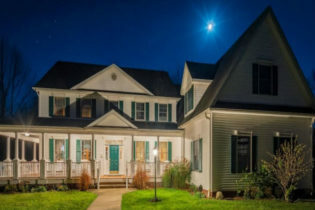 Fitzgerald's Irish Bed & Breakfast is located in Painesville, OH, 30 minutes east of downtown Cleveland, close enough to enjoy a Browns, Indians, Cavaliers or Force game. Also in Cleveland is the Rock-n-Roll Hall of Fame, the theater district, Severance Hall, Cleveland Metro Parks Zoo, and the Cleveland Museum of Art. 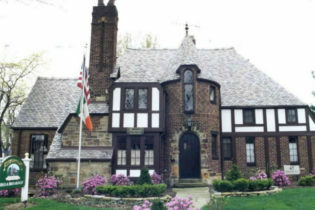 Fitzgerald’s Irish Bed & Breakfast is located 30 miles east of Cleveland in downtown Painesville, OH and is easily accessible from Route 2 or I-90. 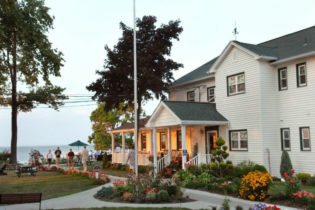 The inn offers warm Irish hospitality in a unique sixteen-room French Tudor constructed in 1937. 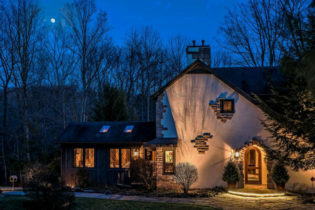 This recently restored home is a landmark of craftsmanship, from its ornate staircase, hard-wood floors throughout, unusual turret and slate roof, to its elaborate 11 foot fireplace. Ideally located across from the main campus of Kenyon College, The Gambier House in Gambier, OH was built in 1845, and has been lovingly restored & decorated. It features a formal parlor, family room, fireplaces, antiques, and hidden staircases, as well as five bedrooms & an attached suite. Enjoy the tranquility of the weeping cherry courtyard or watch the world go by on a front porch rocker. The gracefully elegant mixture of Victorian and Country charm is an invitation to relax, take a deep breath, and enjoy all that surrounds you at The Gambier House in Gambier, Ohio. Whether entering through the cast-iron fence to the front door or by way of the trellised back courtyard, guests cannot help but be enveloped by the special warmth of this 1845 home, built by one of Kenyon College’s master carpenters. 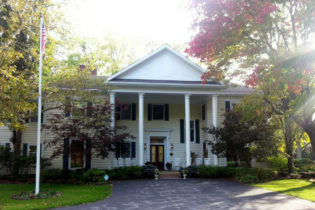 The inn features a formal parlor, family room, fireplaces, antiques, and hidden staircases. Choose from six beautifully decorated guestrooms – all have queen beds and private baths, and some have fireplaces. A gourmet breakfast is a prime attraction at the House. Specialties include country frittata, savory souffle, whole wheat buttermilk pancakes and french toast. All dishes are made with local ingredients when in season. Gambier is ideally situated in Knox County and only five miles away from Mount Vernon. As the home of Kenyon College, during the school year Gambier is the site of many athletic, academic and artistic attractions. As you leave the country road and enter the 140 acre estate, you will find the stunning Scottish Highlands in Ohio’s Hocking Hills. Glenlaurel Scottish Inn & Cottages offers old-world elegance with the architectural style of Scotland’s influence. Choose from one of our 19 accommodations including rooms and suites for a B & B feel or enjoy the peace and seclusion of a Croft (350 sq foot) or Cottages (750 sq feet) in the Hamlet. With our full service dining you will wake to the promise of a 3 course gourmet breakfast, then Let our Chef prepare a gourmet picnic basket to explore Glenlaurel’s miles of hiking trails with breathtaking views of waterfalls in the Camesfearna Gorge, tree and fern lined paths, find your favorite table or couples swing, play a round of Historic Scottish Links Golf with Hickory shaft clubs and sand greens. Continue your escape with a soak in your hot tub and be ready for the Pipers call to dinner with our 3, 6 or 7 course fine dining. The Hocking Hills are full of attractions from a canoe trips to zip lining to spa treatments, let our Concierge help plan your visit. 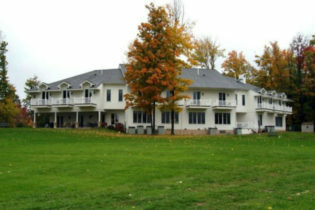 Built in 1848 and listed on the National Register of Historic Places, Inn At Brandywine Falls is located in Northfield, OH. The inn overlooks Brandywine Waterfall has been luxuriously renovated and made modern. We offer six private guest rooms with comfortable king beds and private Victorian baths perfect A little barn is behind the main house has been renovated and made into elegantly rustic suites called “The Granary” and “The Loft”. Each has a main floor and a sleeping loft. Guest enjoy countless options for entertainment and dining as well as sports, history, the arts and shopping… even amusement parks! We invite guests to explore nature while visiting; watch the fire dance, read, or doze off in our peaceful setting. 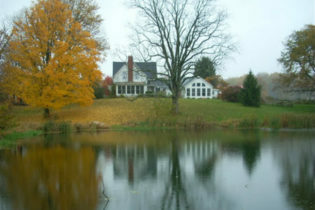 Nestled in the beautiful woods of Burton, Ohio is the Red Maple Inn, a peaceful hideaway. 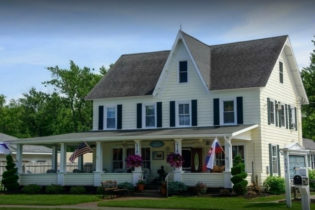 Located in the fourth-largest Amish community in the world, the Red Maple Inn is surrounded by the rolling farmlands and forest of Geauga County. The inn is less than an hour away from Cleveland, Akron, and Youngstown, OH. We offer 6 different styles of guest room - all with private baths and Jacuzzis. Recipient of the AAA 4-Diamond award. In-room massages available. Enjoy the country aesthetic of the Red Maple Inn, a AAA Four-Diamond “small hotel” that offers the intimacy of a B&B. Each of our 18 rooms and suites exudes the character of Amish country with handcrafted Amish furniture and antiques. Enjoy the view of the rolling farmlands from your private balcony or curl up in front your room’s fireplace. You can even burn off the morning’s hearty Amish breakfast in the inn’s fitness center. 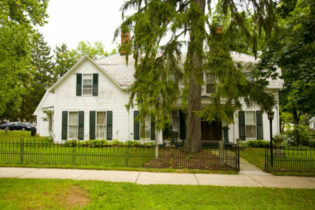 Enjoy the clean air and open fields of Burton, Ohio by taking a stroll through neighboring Century Village, a restored village that displays the area as it was the 1800s. Geaugua County is also home to 18 wonderful parks and 11 scenic golf courses. Seek out the region’s recreational attractions such as fishing at Headwater Park, a day trip to Pioneer Water Land, horseback riding, and bicycling down quiet country lanes. A short drive takes you to Amish furniture and crafts stores, antique dealers and cheese tasting rooms, and lakes for summertime swimming and boating or cross-country skiing facilities in the winter months. Please inquire about hosting your meeting or corporate event with us. Sojourner's Lodge & Log Cabin Suites is a secluded countryside retreat tucked away on 20 acres in Dundee, OH in the heart of Ohio's Amish Country! Come and relax by our lake, enjoy hiking through our woods, or sit by the crackling fire pits in the evening! Amish country attractions are all nearby! When visiting Amish Country in Holmes County in Dundee, Ohio, stay nowhere else except Sojourner’s Lodge & Log Cabin Suites, tucked away on 20 acres, surrounded by rolling farmland, woodland, and a 3-acre lake. Visit Amish communities such as Winesburg, Wilmot, Mt. Eaton, Berlin, Mt. Hope, Walnut Creek, Millersburg, and Sugarcreek, all within 20 minutes. 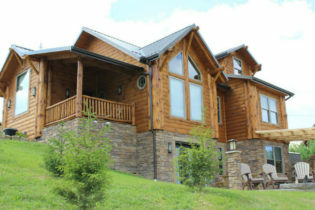 Guests can choose to stay in one of four lodge suites or one of two log cabins. The lodge suites and log cabins offer fully-equipped kitchens, living rooms with sofas, fireplaces, and TVs with DirecTV. During their stay, guests enjoy relaxing by the fire pit at night with friends, hiking our trails, and bird watching by the lake. 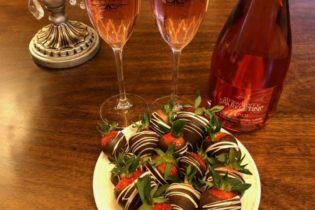 Sojourner’s Lodge & Log Cabin Suites is the perfect family getaway destination, romantic getaway, or place to come with girlfriends or another couple for a peaceful retreat. Stay here and find a haven of rest and relaxation. Welcome to The Sanctuary at Wild Rose Acres; a serene haven, located on a secluded horse farm, where you can write, read, paint, create anything, even peace. The Sanctuary at Wild Rose Acres is a serene haven, located on a secluded horse farm, where you can write, read, paint, create anything, even peace. Views of pond, garden and fields. Cathedral ceiling, king sleigh bed. Fabulous, spa/bath, tiled in shimmering blues, bidet, 4×4 tiled, benched shower, 150 gal Japanese Soaking Tub. Private entryway, WiFi, microwave, mini-refrigerator, breakfast served in your room, morning newspaper, air conditioning, iron, ironing board, and hair dryer. Alarm clock, T.V., DVDs and books on request. The Sanctuary also offers Alternative Therapies including Reiki, Equine Assisted Therapy and CranioSacral Therapy. Welcome to the award-winning Welsh Hills Inn in historic Granville, Ohio. Nestled on a quiet hilltop on 15 beautiful acres with numerous activities for guests to relax and enjoy. TripAdvisor Travelers' Choice Award Winner 2013-2018. Rated #1 in the U.S. adn #4 in the World. Ohio's B&B/Inn of the Year 2013, 2015, and 2017. Relaxation. Redefined. 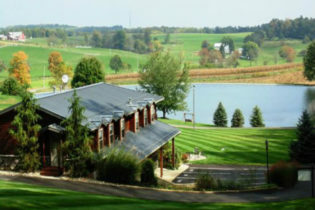 The award-winning Welsh Hills Inn is located in the rolling hills of Granville, Ohio. Our inn is nestled on a hilltop on 15 wooded acres on a peaceful country road in the Welsh Hills countryside. The Inn is located in the equestrian countryside of Granville and is just minutes from many college campuses and village attractions. We are the perfect spot to stay when looking for gracious hospitality and comfort. We offer guests five large guest rooms, including two suites, with luxurious bedding and bath amenities, and spacious bathrooms. Throughout the inn, guests enjoy the antiques, original artwork, and cozy modern comforts made perfect for a relaxing getaway. During the Spring to early Fall, guests can enjoy the outdoor heated pool and courtyard gardens and, year-round, our state-of-the-art hot tub spa. Each morning we provide guests with a complimentary, homecooked Signature Inn breakfast and, late each afternoon, a wine and cheese gathering.